Examine the DHCP configuration between R2 and R3,R2 is configured as the DHCP server and R3 as the client. What is the reason R3 is not receiving the IP address via DHCP? A. On R3,DHCP is not enabled on the interface that is connected to R2. B. On R3,the interface that is connected to R2 is in shutdown condition. First we should check which interface on R3 that is connected to R2 via the “show run” command. From the description we learn interface E0/1 is connected to R2. 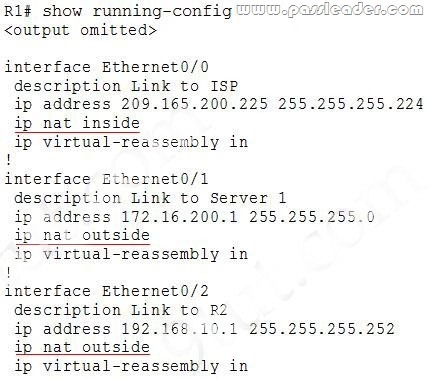 Use the “show ip interface brief” command to verify the IP address of this interface. Therefore we can conclude this interface does not have any IP address and there is no configuration on this interface (except the “description Link to R2” line). If R3 wants to receive an IP address from R2 via DHCP, interface E0/1 should be configured with the command “ip address dhcp” so the answer “DHCP is not enabled on this interface” is correct. R1 router clock is synchronized with ISP router. R2 is supposed to receive NTP updates from R1. But you observe that R2 clock is not synchronized with R1. What is the reason R2 is not receiving NTP updates from R1? First we should verify if the ports connected between R1 and R2 is in “up/up” state with the “show ip interface brief” command on R1 & R2. 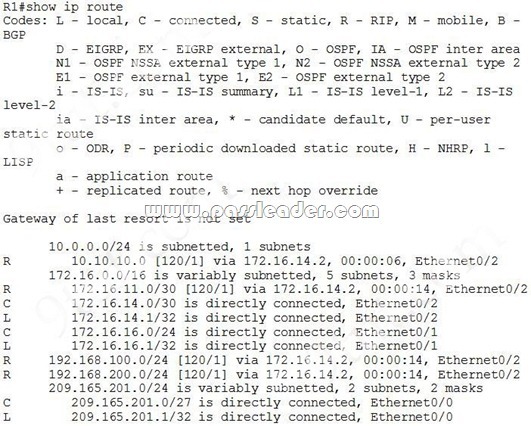 Note: We learn R1 & R2 connect to each other via E0/2 interface because the IP addresses of these interfaces belong to 192.168.10.0/30 subnet. Both of them are “up/up” so the link connecting between R1 & R2 is good. Next we need to verify the ntp configuration on R2 with the “show running-config” command. So there is only one command related to NTP configuration on R2 so we need to check if the IP address of 192.168.100.1 is correct or not. But from the “show ip interface brief” command on R1 we don’t see this IP -> This IP address is not correct. It should be 192.168.10.1 (IP address of interface E0/2 of R1), not 192.168.100.1. Why applications that are installed on PCs in R2 LAN network 10.100.20.0/24 are unable to communicate with server1? This access-list is applied to E0/2 interface with inbound direction. 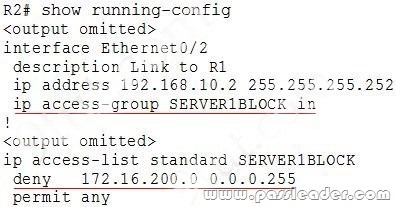 The purpose of this access-list is to block traffic with source IP address of 172.16.200.0/24 so it will block all traffic sent from Server 1 to us. Users complain that they are unable to reach internet sites. You are troubleshooting internet connectivity problem at main office. Which statement correctly identifies the problem on Router R1? A. NAT configurations on the interfaces are incorrectly configured. D. Only static NAT translation configured from the server, missing Dynamic NAT or Dynamic NAT overloading for internal networks. We notice that interface E0/0 (connected to ISP) has been configured as “nat inside” while interfaces E0/1 & E0/2 (connected to our company) have been configured as “nat outside”. This is not correct because “nat inside” should be configured with interfaces connected to our company while “nat outside” should be configured with interfaces connected to the internet. Therefore we can conclude the NAT configuration on these interfaces is not correct. – Router R1 connects the main office to internet, and routers R2 and R3 are internal routers. – NAT is enabled on Router R1. 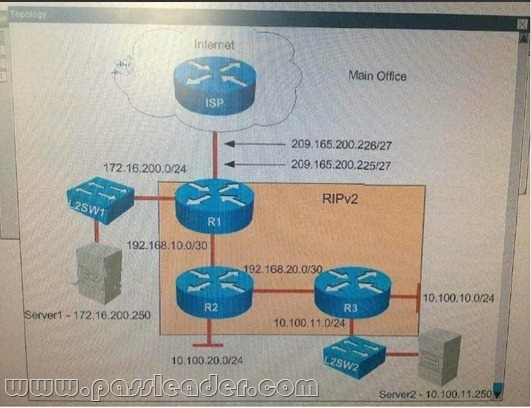 – The routing protocol that is enabled between R1, R2 and R3 is RIPv2. – R1 sends default route into RIPv2 for internal routers to forward internet traffic to R1. 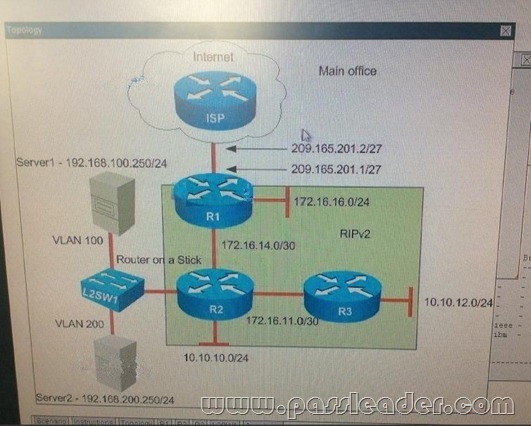 – Server1 and Server 2 are placed in VLAN 100 and 200 respectively, and are still running on stick Configuration with router R2. You have console access on R1, R2, R3 and L2SW1 devices. Use only show commands to troubleshoot the issues. Server1 and Server2 are unable to communicate with the rest of the network. Your initial check with system administrators shows that IP address settings are correctly configured on the server side. What could be an issue? We see that sub interface E0/1.100 has been configured with VLAN 200 (via “encapsulation dot1Q 200” command) while Server1 belongs to VLAN 100. Therefore this configuration is not correct. It should be “encapsulation dot1Q 100” instead. The same thing for interface E0/1.200, it should be “encapsulation dot1Q 200” instead. You have console access on R1, R2, R3 and L2SW1 devices. Use only show commands to troubleshoot the issues. Examine R2 configuration,the traffic that is destined to R3 LAN network sourced from Router R2 is forwarded to R1 instead R3. What could be an issue? 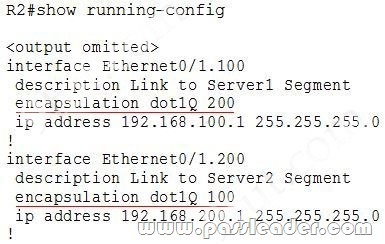 In this table we cannot find the subnet “10.10.12.0/24” (R3 LAN network) so R2 will use the default route advertised from R1 (with the command “default-information originate” on R1) to reach unknown destination, in this case subnet 10.10.12.0/24 -> R2 will send traffic to 10.10.12.0/24 to R1. Next we need to find out why R3 did not advertise this subnet to R2. A quick check with the “show running-config” on R3 we will see that R3 was not configured with RIP ( no “router rip” section). Therefore we can conclude RIPv2 was not enabled on R3. You have console access on R1, R2, R3 and L2SW1 devices. Use only show commands to troubleshoot the issues. What is the correct statement below after examining the R1 routing table? A. 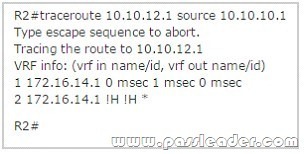 Traffic that is destined to 10.10.10.0/24 from R1 LAN network uses static route instead RIPv2. B. 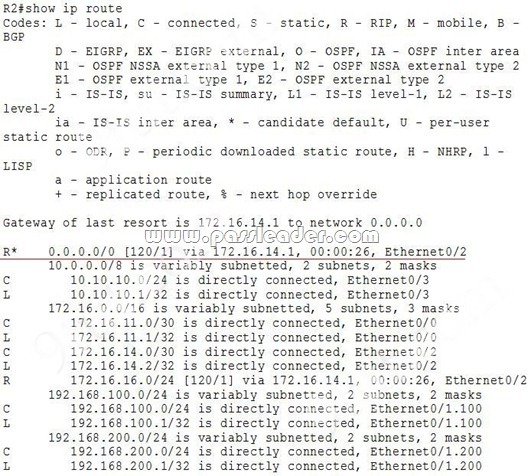 Traffic that is destined to 10.10.10.0/24 from R1 LAN network uses RIPv2 instead static route. C. Traffic that is destined to 10.10.10.0/24 from R1 LAN network uses static route instead RIPv2. Because the traffic is forwarded to the ISP instead of the internal network. D. Traffic that is destined to 10.10.10.0/24 from R1 LAN network uses RIPv2 instead static route.